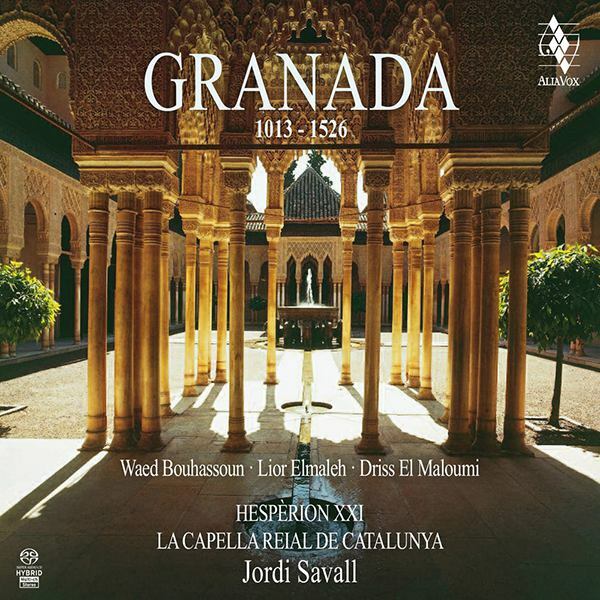 This historical and musical evocation of five centuries in the life of one of the most important and admired cities in Muslim Andalusia takes as its inspiration and starting-point the founding in 1013 of the kingdom of Granada by Zawi ibn Zirid on the ancient site of Garnata al-Yahud, or “Granada of the Jews”. Specially commissioned by the Granada Festival of Music and Dance, this programme was conceived and created to celebrate the millenary of the founding of the Kingdom of Granada. 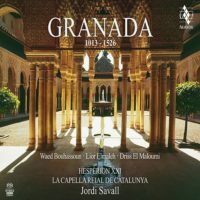 Most of the music on this CD was performed and recorded live during the concert given on 1st July 2013 at the Palace of Charles V in the Alhambra. and the forced conversion of the Muslims. To appreciate the great wealth of cultural exchanges, influences and traditions which converged at the founding of the Kingdom of Granada by Zawi ibn Zirid on the ancient site of Garnata al-Yahud, or Granada of the Jews, we must go back to the beginning of the 5th century. The presence of Jewish communities in Andalusia and their relations with Christians began to worry the ecclesiastical hierarchy at the Synod of Elvira (Granada) at the beginning of the 4th century. A century later, Severus of Minorca, in an encyclical letter dated 417, refers uneasily to the friendly relations between Jews and Christians. Some years earlier, in 409, the invading Vandals, Suevi and Alani had put an end to more than four centuries of Romanization on the Iberian Peninsula and established the Visigothic-Mozarabic liturgy, an influence which was to persist until 812, when the Byzantine emperor recognized Charlemagne as the legitimate Roman Emperor of the West. The Byzantine influences in Visigothic-Mozarabic music can also be explained by the close relations between the Iberian Peninsula and Constantinople, which were particularly intense following the visits of St. Leander and other Church Fathers to the capital of the Eastern Empire. Although the music of the Visigothic, or Mozarabic, rite was at its peak from the Council of Toledo in 633 (presided over by St. Isidore of Seville) until 711, when the irruption of the Muslims brought Visigothic rule to an end, it continued to be practised throughout Andalusia until the 11th century. After the arrival of the Muslims, the term “Mozarabic” was used to refer to all Christian liturgical music practised in territories under their rule. Although many of the liturgical melodies dating back to long before the Muslim invasion continued to be used, Arab music exerted a great cultural influence from the 8th to the 11th centuries, leading to a natural decline of Mozarabic music. However, the major problem with all these musical forms, as indeed with most music from the early Middle Ages, is that it was written in neumes, which even today remain difficult to decipher and at best allow us only to speculate on the approximate pitch of the sounds, while we can barely hazard a guess at their precise length. Secular Visigothic music, on the other hand, fused with the new Arab music introduced after 711, resulting in an extraordinary musical culture. When the Muslims set foot in Andalusia they were still socially prejudiced against music; indeed, the profession of musician was considered immoral or even dishonest, and a proof of the low esteem in which musicians, singers and paid mourners were held is that their evidence was never admitted in court hearings. With the advent of Abd al-Rahman I (also known as “the Just”), the first emir of the Umayyad dynasty in Al-Andalus, music began to play a much more prominent role, until finally, with the arrival of the renowned musician Abu-al-Hasan Ali ibn Nafi, nicknamed Ziryab, it came to be one of the most highly prized art forms in Al-Andalus, particularly among the upper classes. Little by little, the austere Muslim customs were relaxed and music was increasingly widely practised in all social classes. Almost three centuries before the Alhambra was built, Granada was already a prosperous and fascinating kingdom administered by Jewish viziers, who placed their intelligence at the service of King Badis ibn Habbus al-Muzaffar (1038 and 1073), a monarch of the Zirid dynasty of North African-Berber descent. Sadly, however, this period of development and harmonious coexistence was brutally cut short by the terrible persecution and massacre of the Jews of Granada in December 1066, described in the Memoirs of Abdallah ibn Buluggin, the last king of the Zirid dynasty (1073-1090). Not long after the latter’s accession to the throne, his kingdom had become impoverished as a result of the punishing tributes exacted by the Christian King Alfonso VI in exchange for protection against Granada’s long-standing rival, the taifa kingdom of Seville. Throughout the 11th century, the great internal conflict, or fitna, of Al-Andalus fractured the unity of the caliphate of Cordoba, giving rise to a mosaic of small states known as taifa kingdoms. Like all the other taifa kingdoms of Al-Andalus, the kingdom of Granada was weak, a prey to constant divisions and internal strife. Taking advantage of this state of affairs, at the end of the 11th century the Almoravids from North Africa disembarked on the peninsula under the command of Yusuf ibn Tashfin, the head of an empire that stretched from Algeria to Senegal. Emboldened by the sympathetic stance of some locals, who were dissatisfied with the bad government of the Zirids, as well as the support of such influential figures as Kadi Abu Jafar, Tashfin entered Granada in 1090, toppled the last Zirid king, Abdallah, and added the territories of Eastern Andalusia to his empire, before going on to challenge other taifas, as well as Christian kings in the north of the peninsula. On the death of Tashfin, the last king of the Almoravid dynasty, the Almohads moved in from North Africa to fill the political vacuum, establishing themselves in the Muslim territories of the peninsula by conquering each successive taifa in their path. The city of Granada was conquered in 1157. Despite the supposed political stability of the Almohads, various taifas attempted to regain their independence, spurred on by local interests and powerful families who had been stripped of their old privileges. In Granada, the most famous of these challenges occurred in 1162, when Muhammad ibn Sad, with some Almoravid support, fought the Almohads at the bloody battle of al-Sabika. In spite of the Almohads’ success in creating a degree of stability and even in curbing the conquering zeal of the Christian kingdoms, the victory of the Christian armies at the Battle of Las Navas de Tolosa in 1212 opened up a breach in Western Andalusia and ushered in the end of the dream of Al-Andalus. The Nasrid kingdom of Granada, known as the sultanate of Granada, was founded in 1238 by the Nasrid noble Mohammed-ibn-Nasr. Despite being subject to pressure on all sides, the kingdom survived thanks to its geographical situation, which made the territory easy to defend, as well as its highly diversified economy and trade with the Christian kingdoms of the peninsula, as well as the Muslims of the Maghreb and the Genoese across the Mediterranean. However, it gradually lost territories to the Crown of Castile and finally capitulated after the War of Granada (1482-1492). The Nasrid kingdom of Granada was to be the last Muslim state of Al-Andalus on the Iberian Peninsula. 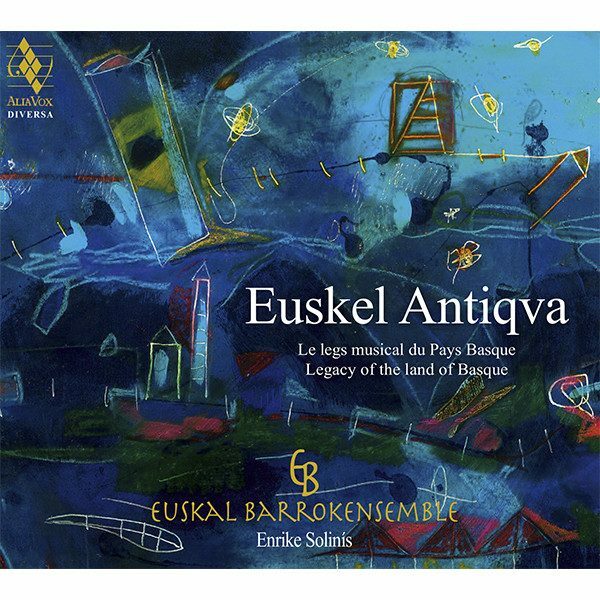 The music accompanying us on this fascinating journey to one of the most extraordinary periods in what has come to be known as the “Spain of the three cultures” is drawn from a wide variety of origins and traditions. Jewish music is represented here by the ancient texts of poets such as Dunash Ben Labrat and Yehudah Halevi (1075-1141), and the recited texts of the famous Andalusian Jewish physician, rabbi and theologian Maimonides, as well as the Song of Songs, exquisitely performed according to the ancestral oral traditions of an ancient Sephardic community from Southern Morocco by our cantor Lior Elmaleh. 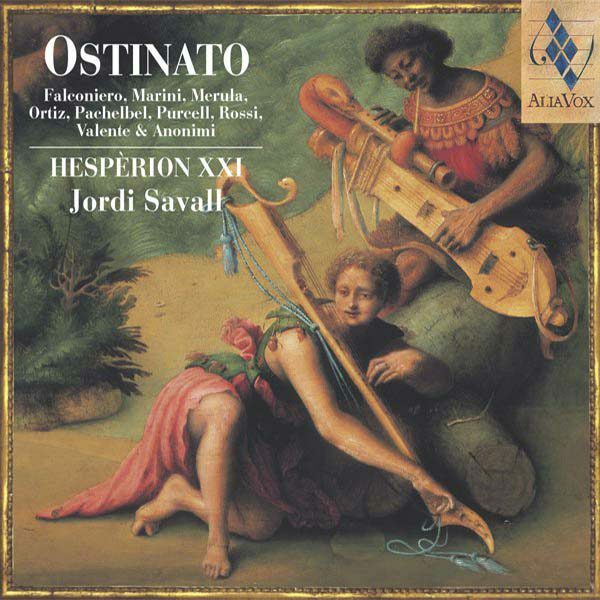 We shall also hear the beautiful anonymous Sephardic prayer (Salonika tradition), which was sung during the important ritual feast of the Pesach Sedercelebrated on the first night of Passover – an expressive chant, “The bread of affliction”, magnificently performed in Ladino by the soloists of La Capella Reial de Catalunya in dialogue with the improvisations of cantor Lior Elmaleh. Christian music is represented by works from the Mozarabic repertories and the medieval Hispanic codices and manuscripts, in particular theCodex Las Huelgas and the Cantigas de Santa María of King Alfonso the Wise, border ballads and ballads on the theme of the Wars of Granada, and, dating from the final period, villancicos by Juan del Enzina, Gabriel and anonymous pieces from the Cancionero Musical de Palacio performed by the soloists of La Capella Reial de Catalunya and Hespèrion XXI. The music is complemented by historical texts eloquently recited by the poet, Hebraist and Arabist, Manuel Forcano. To evoke the vast wealth of Islamic Andalusian culture, we have chosen muwashshahs and maqams, texts and poems by authors such as Ibn Zamrak, Ibn Zuhr (also known as Avenzoar, 1073-1162) and anonymous dances, which were preserved in the cities and countries to which the Andalusian Muslims emigrated in vast numbers both during and after the Wars of Granada. 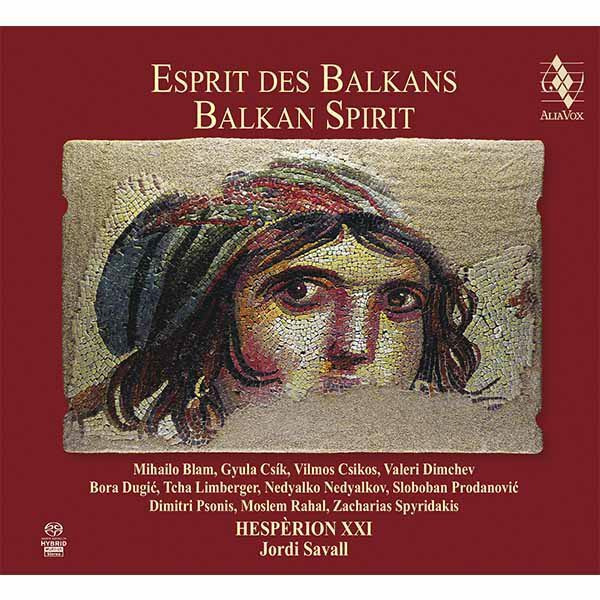 Thanks to their creative talent in the arts of vocal and instrumental improvisation, our singers and musicians from Syria, Morocco, Turkey, Greece, and Israel – all versed in the the Arabo-Andalusian styles preserved chiefly in North Africa and the Middle East –beautifully recreate this music which has been passed down through the oral tradition. Our final historical and musical evocation concludes by remembering the forced conversion of all the Muslims of the Kingdom of Granada in 1502. Conveying all the emotion and tragedy of that ultimate arbitrary imposition, we shall hear a moving dialogue improvised between the Syrian singer Waed Bouhassoun and the Israeli cantor Lior Elmaleh on the Andalusian lament Maqam Hizaj by Al-Andalus’s greatest poet, Ibn Zaydun (1003-1071), expressively accompanied on the oud, kanun and ney, embodying the extraordinary vigour of traditions which for centuries have been handed down from parents to children, from teachers to pupils, and which live on, thanks to the efforts and talent of all these remarkable Eastern musicians. This recording is a passionate testimony to the power of music in bringing about intercultural dialogue, as well as a fervent homage to all the musicians whose extraordinary talent, humanity and generous capacity for committed dialogue, irrespective of their individual origins, cultures and beliefs, have made this project possible.